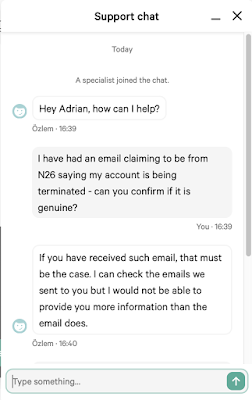 RevK®'s rants: What are N26 bank up to? 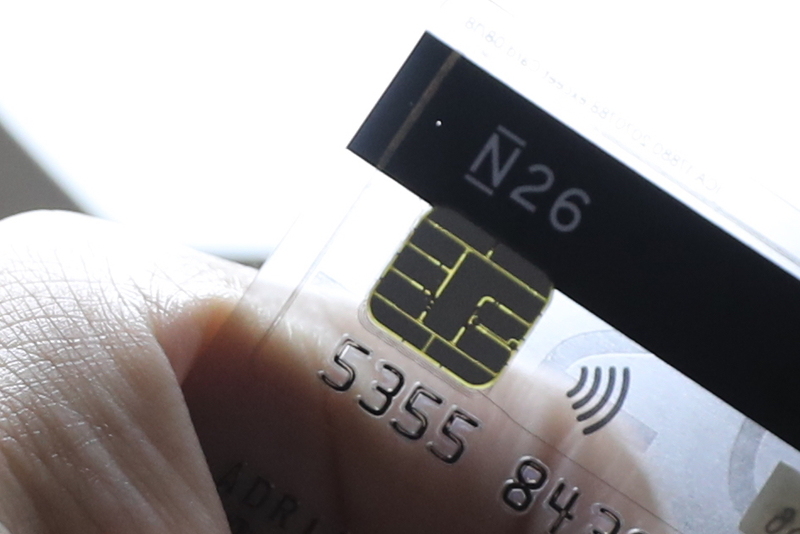 N26 (www.n26.com) are a new/challenger bank much like Starling or Monzo (both of which are great). So I got an account, mainly because of the cool see-through card. They have a Master Card and a UK sort code and account number which is great. But they are a bit odd as they handle Fast Payments but not BACS which is very strange having allocated a proper account number. 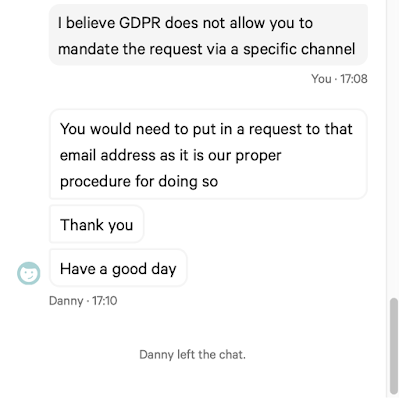 What was a problem is that they were unable to change my email address, and failed to do so in one month even when I made a formal request as per GDPR to correct my personal information. However, after some months, they finally fixed their system and change the email address. Well done. The other issue I have is their support are terrible. When I had a longer email address they were frequently unable to "validate" me at all, and would just hang up the chat. Indeed, hanging up the chat in a style of "slamming the phone down" seems to be "their thing". Very annoying! I was waiting to see how they would do - maybe get BACS working, and what else. It has been interesting seeing how Monzo and Starling have progressed and I was hoping for good things from N26. But they are pretty quiet to be honest. Anyway, out of the blue today I get an email saying my account is being terminated in May. No explanation whatsoever. Really? Would be nice to say why, at the least. I could understand if because I have not used it for a couple of months, etc, and indeed, if that is the case I may start using it. But nothing, and it says their support people won't be able to tell me why - cryptic. Once again, not impressed by support, it seems that "if I have received such email, that must be the case". That is unbelievably bad advice from a bank. I am shocked! 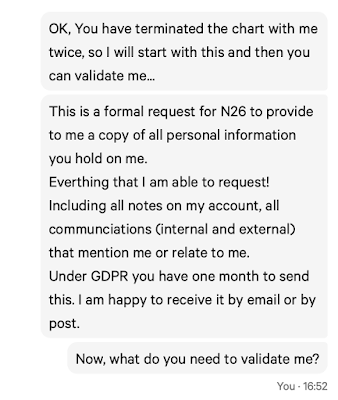 It gets worse, I asked if he could actually confirm it was the case, and went though "validation" (which now works) and then I get hung up on with a most unhelpful message to check the email. The email says nothing but the termination date! I already replied to the email and had nothing back. So, I tried again, and got the same! 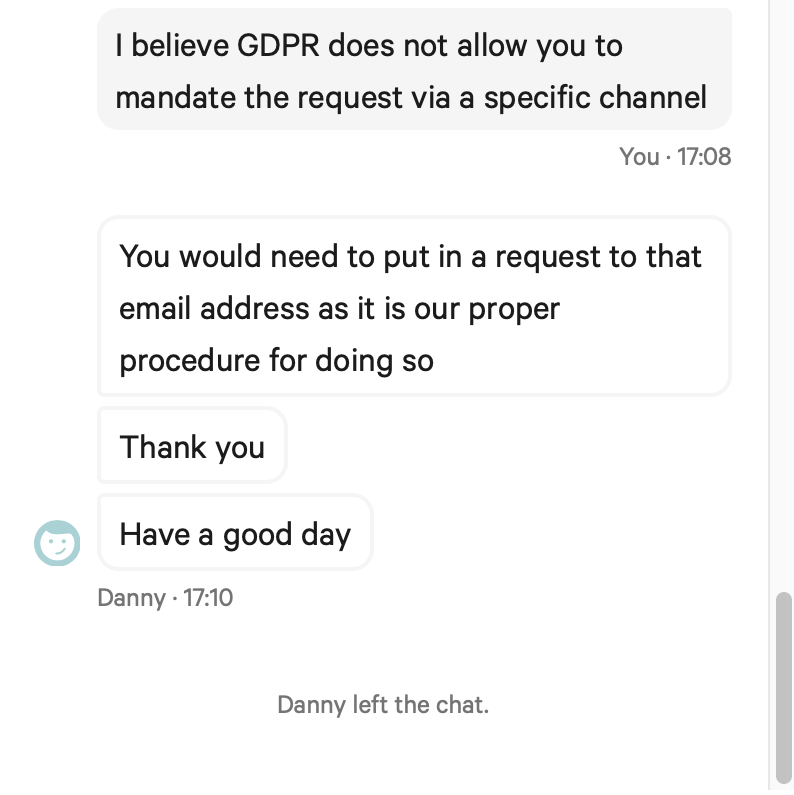 So this time I started with a GDPR request and then went though validation... Minor typos, grr. I went through validation and the guy takes a long time but tells me to email them. 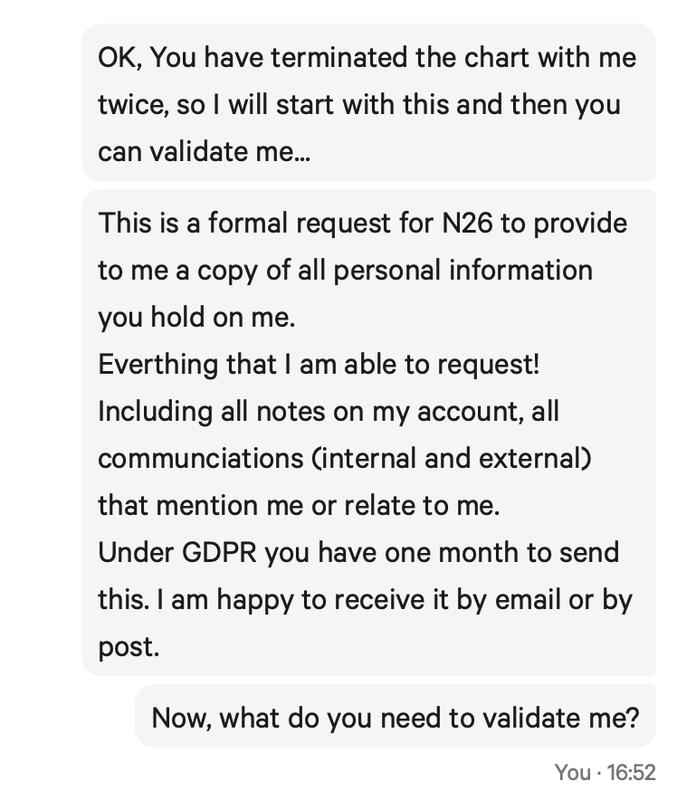 I pointed out that (as far as I know) GDPR does not allow them to mandate a specific form for such a request, but he hangs up on me! So I have emailed anyway. 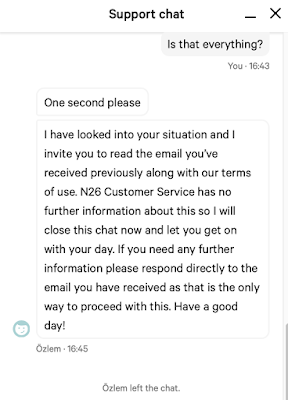 This is appalling customer service. 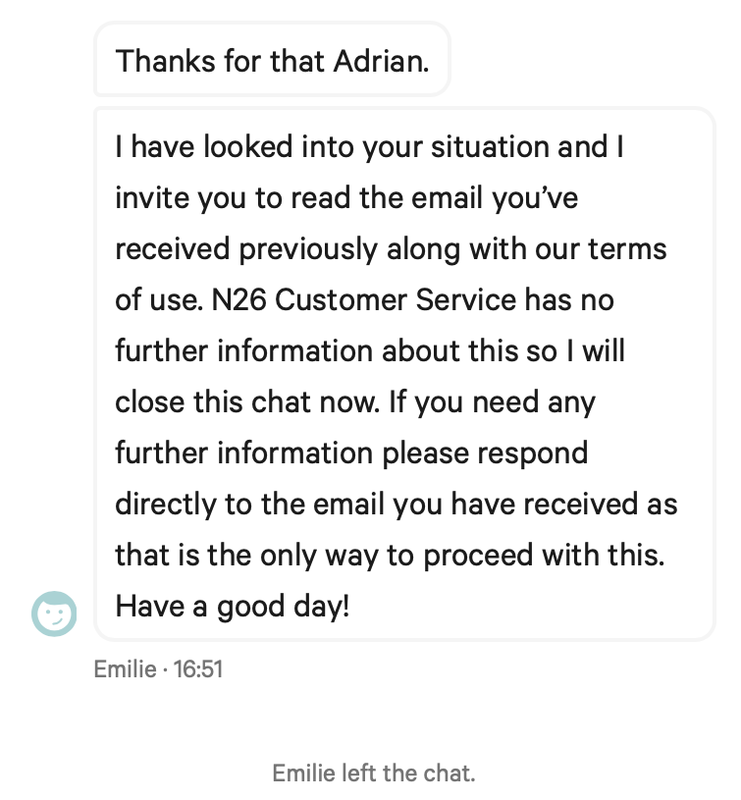 It is not just because they are terminating the account for some reason, they are appalling at the best of times from my experience, but this is just special, and not very GDPR compliant. So, hopefully they will comply, and that should mean I find out why they are terminating my account. We'll see. 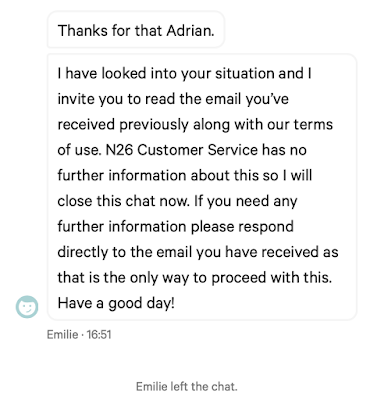 It is certainly something to think about if you are considering N26 as your main bank account. At this point I would not take them seriously at all. How bizarre - something about inactivity maybe? I hope they do eventually comply with the law regarding SAR - I had a bit of a fight with Sage's online dis-services earlier in the year (who took the "interesting" line that any SAR - regarding *my* user account with them - could only be filed via my employer, not directly, which I've forwarded to ICO to investigate; they also claimed to be "unable" to extract PDFs from their own PDF generation system on request). As someone who actually makes a serious effort to comply with the law, it's very frustrating to see companies apparently getting away with blatantly ignoring it. 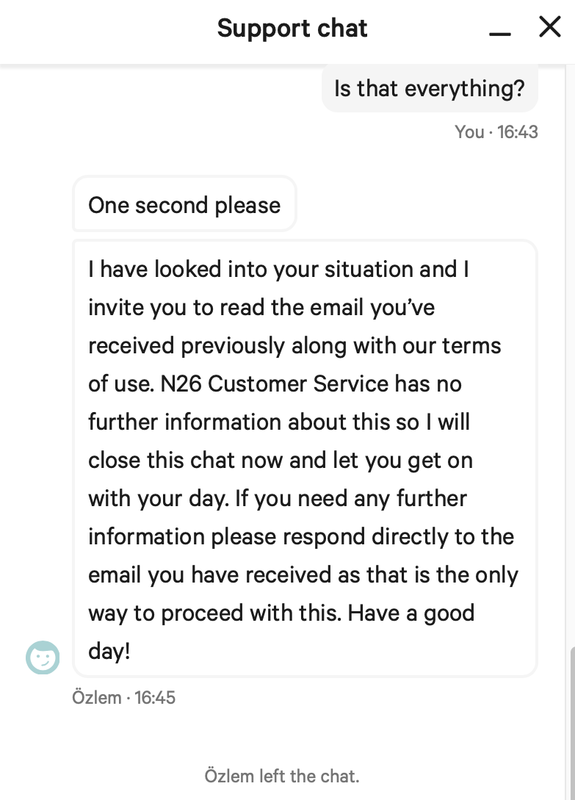 Thanks for the warning, too: having been happy with Revolut and Curve for payments, I'd have been quite likely to try N26 sometime - now I know to avoid them like the plague. I argued that even if they are the data processor for someone else (who is the data controller) then there should be nothing they hold in addition to that which they supplied to the controller. But if course, they have other data on me not for the data controller they were quoting, but for themselves, making them data controllers also and therefore need to respond. I do know if that banks do suspect fraud, they're not allowed to tell you anything that might tip you off that they suspect fraud. When I worked for a supermarket-named-bank-and-insurer, our "Fraud Team" for insurance was definately not called the "Fraud Team" and we were banned from speaking that word. I couldn't even find a phone number or address on their website. It may well be there somewhere, but lack of contact options are a complete turn-off for me especially when my money is the matter at hand. 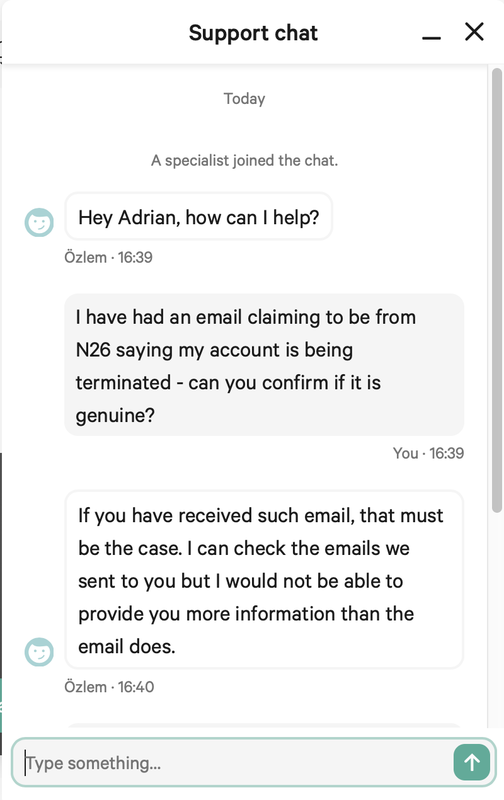 "If you represent the authorities or work for another bank, you can get in touch using the following email address: officials@n26.com". Well, if even the authorities are told to email them (and who knows when they might get a reply and what if the matter is sensitive and not suitable for discussion by email), then what hope us mere little customers. No, I think I'll stick to a bank that has a phone number and can be easily contacted, myself.